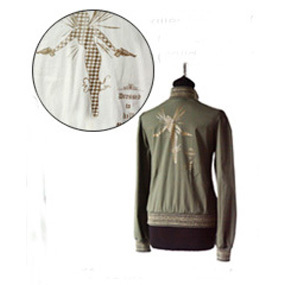 Bodybag by Jude Clothing First Class Jacket - Womens full zip poplin jacket - photo shows back of jacket in khaki - stocking in black - front is a full zip style. no logos on front. Gold fairy print on back is a must have. Fabric is 97 cotton, 3 spandex.